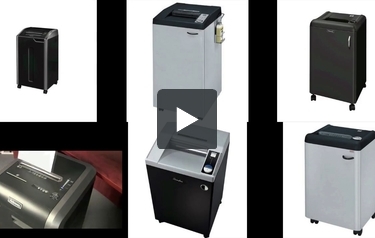 The following shredders are all TAA Compliant--approved for use in government agencies. Choose from great U.S. name brands like Fellowes and Swingline that boast new features and innovation and are consistently at the forefront of shredder technology. Choose from a variety of styles including strip cut, cross cut, and micro cut to cover all of you security needs. Additionally, the machines featured below have varying security classifications, so be sure you select the security level your department requires. If you have any questions or require a quote, give us a call or email us today! Waste Bin Capacity: 36 gal. This is MyBinding video. MyBinding sells a great many shredders that are all TAA compliant, approved for us in government agencies. Combined with our CSA, binding for you agency has never been simpler. We have great US-named brands, like Fellowes and Swingline that boasts new features and innovations that are consistently at the forefront of shredder technology. You’ll find a variety of shredding styles, from strip cut, cross cut, micro cut, giving you total control when it comes to securing sensitive information. There are plenty of descriptions throughout our entire website and if you have any questions at all, give us a call. We pride ourselves in our customer service and we’ll find you exactly what you need. When image matters, MyBinding.